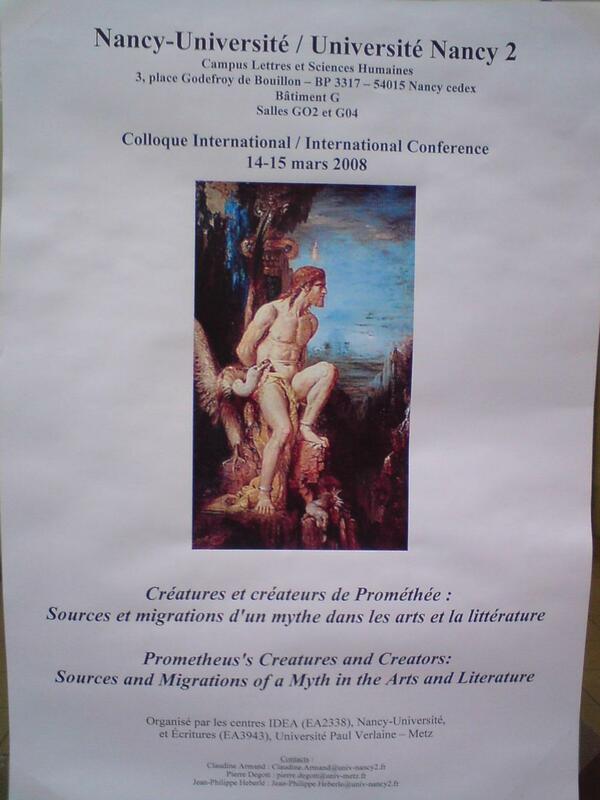 ‘Prometheus’s Creatures and Creators’ was co-organised with the Ecritures research group at Metz University. The conference brought together participants from France, other European countries and North America. Given the number of speakers, it was necessary to organise parallel sessions, which were primarily structured around thematic and generic relations between the talks. The first day of the conference was devoted to the arts (painting, cinema, dance and music), while the second day was specifically devoted to literature. The presentations on literary topics were organised so as to roughly follow a chronological sequence, in keeping with the call for papers, which stated that: ‘comparative and interdisciplinary approaches will be privileged. These can follow either a diachronic or a generic logic’. The participants were careful to adhere to the central subject of the conference and to investigate the links that exist between the ‘creatures’ and ‘creators’ of Prometheus – between those things created by the myth and those aspects of the myth created by men and women. The papers delivered during the second day of the conference (devoted to literature) analysed the remanence and metamorphoses of the myth over the centuries, noting how particular aspects of the Prometheus story (Prometheus the rebel, Prometheus the creator, Prometheus as a metaphor for man’s acquisition of knowledge, etc.) were often stressed at a specific period, echoing the broader concerns of the age. The presentations on literary representations of the Prometheus myth thus concorded with those given the previous day (on the arts), arguing that creative references to Prometheus transcend the notion of genre to reflect a vision that is proper to each age or to each episteme. The keynote speaker, the American visual artist Randy Bloom, approached the conference theme through its metaphoric dimension, describing the aspects of the Prometheus myth that resonate with her own artistic output, and particularly her work on colour and light. She thus demonstrated the passages of light that are present on her canvases – physical passages, brought about by the sliding of paint across the canvas and by the superposition of several layers of paint, but also metaphoric passages, suggested by the quality and the texture of the colours she achieves in her art. Her keynote address gave rise to a rich dialogue with the audience on the subject of artistic creation, especially in relation to abstract art. 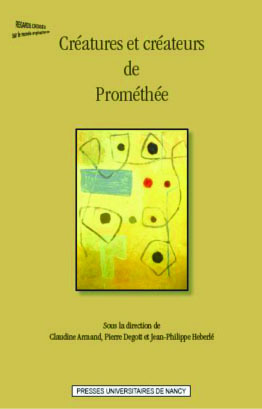 A collection of articles based on the presentations given at the conference was published by the Presses Universitaires de Nancy: Créatures et Créateurs de Prométhée (2010).